One reason I enjoyed spacing out my journey on the 123-km-long Parenzana trail over several months is that I was able to experience the different colours of each season as I cycled or walked through the different landscapes I came across. I started out in Muggia in Italy in early October, cycling through this initial stage of the trail that crosses the border into Slovenia and follows the coast all the way to Buje in Croatia. There was a late summer feel to that October day and autumn hadn't yet fully started. It was a sunny day in November when I walked through Autumn landscapes from Buje to Livade on the second stage. 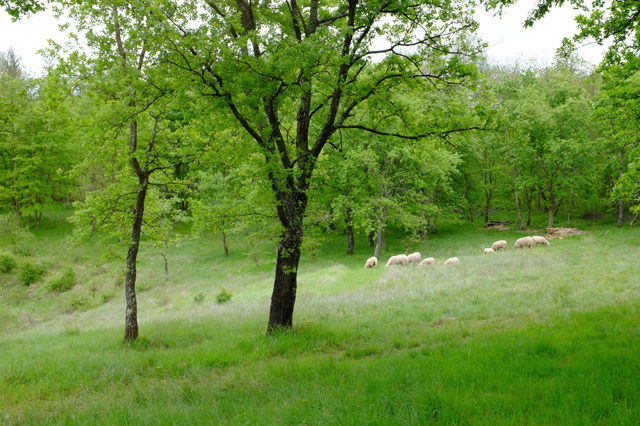 And for the third leg from Livade to Vižinada, the rural scenery I walked through was painted in winter colours. 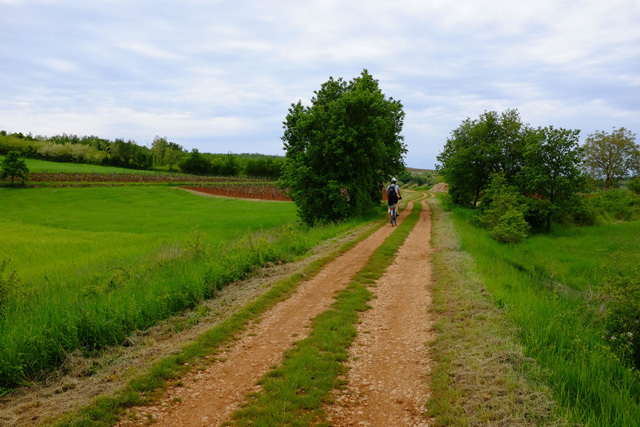 On a day in early May that was threatening rain, I was on the final stretch of the trail from Vižinada to Poreč on my bicycle. 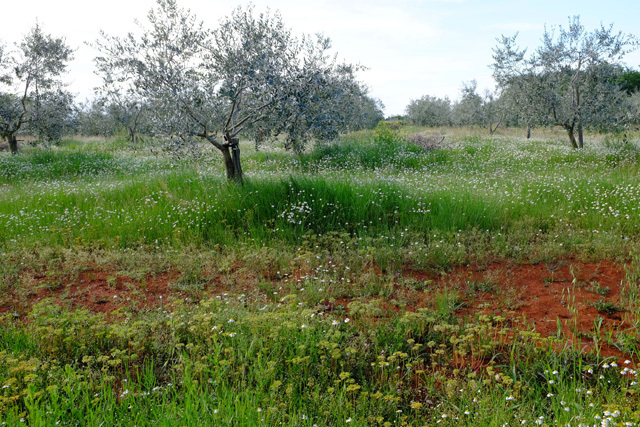 Now the fields, forests and olive groves set in red earth I cycled past were painted in the brilliant green of the first days of Spring. 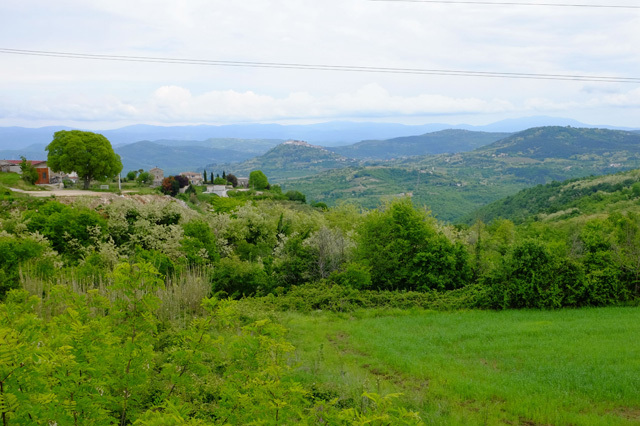 I started off in Vižinada where I took in the stunning view of Motovun in the distance. Hilltop Motovun was the ever present landmark of my previous walk, but now I turned my back on it and headed towards Vižinada. This section of the trail is on a slow and gradual decline so it was an easy ride. The route was pleasant and picturesque, but compared to the previous sections there were fewer 'wow' moments as the land got progressively flatter as I approached seaside Poreč. And there were no scary pitch dark tunnels! I have now completed the 123-km Parenzana trail. Would I do it again? Yes! I would especially like to retrace the section in Slovenia by bicycle and the trail from Grožnjan to Livade on foot. Many people do the entire trail by bicycle in a single day, starting in Muggia, Italy and following the path of the former railway line all the way to Poreč, Croatia. Three countries in one day by bicycle? Yes, in Istria it's possible. 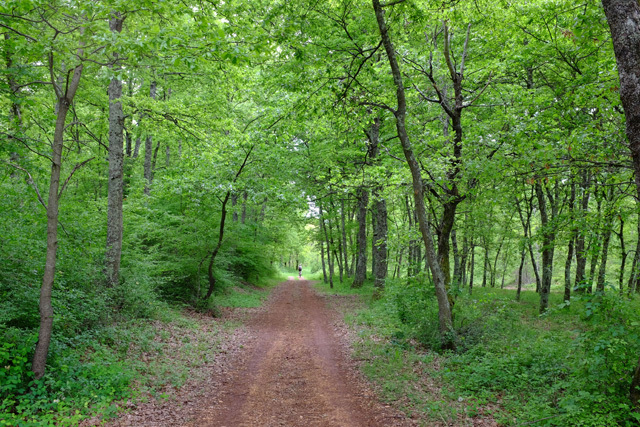 The trail is dubbed 'the route of health and friendship' by the tourist office brochures because it links the three countries that make up geographical Istria. Next I'll be writing a short and handy little guide on the trail with a few tips and recommendations. Coming soon! Great and enjoyable as usual, Isabel. 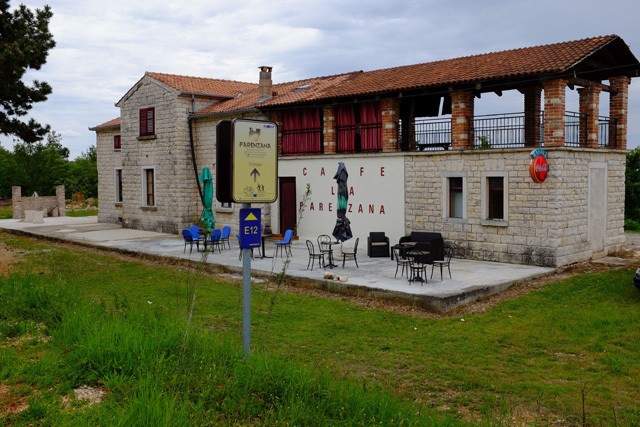 we're heading for Sovinjsko Polje this weekend and I was looking for some bike rental in central Istra. Could not find anything - might just bring a bike with me. Do you have any idea or sugestion? Hi Marcus, thanks for stopping by! Also look up Istra Bike for more information on cycling in Istria. Finally, the tourist office in Pazin has maps available. Enjoy your trip and yes, do come to Gračišće! Thankyou for your advice but Pazin is too far from the Buzet area where we stay. Maybe we do bring our bikes with us and maybe we'll meet in Gracisce! I thought you were looking for bike rental in central Istria... there must be something available in Buzet too. Try the tourist office there. Otherwise it's a 35-minute drive to Pazin. But all roads from Pazin climb uphill so you have to be a really fit cyclist! Enjoy your stay and see you in Gračišće! I just wanted to tell you a new method for storing elderflower syrup that I tried last year. I froze the syrup in 8oz. containers, when they were frozen I transferred the discs to a large freezer bag for long term storage. The syrup kept perfectly and this year I used this method with my entire supply. I hope you find this useful. Your trail pictures are beautiful. Happy Fall. Thanks Lillian! I didn't make elderflower syrup this year because we don't drink a lot of it. But thank you for the tip! Wishing you a happy fall season too!